"It is truly remarkable how widely this factor is ignored." James Carrion recently posted the latest installment of his ongoing research into the likelihood deception perpetrated by the U.S. intelligence community played a significant part in UFO events occurring shortly after World War II. He specifically focuses on the 1946-47 time frame in his work. Some members of the UFO community viewed the post unfavorably. Brad Sparks offered critical assessments via the blog of Kevin Randle, and Robert Sheaffer expressed concerns at his blog, Bad UFOs, among other venues discontent with Carrion's analysis. Responses from James may be viewed at his blog, Anachronism. I'd like to express some thoughts on the matter. First of all, I think we should encourage dialog. Hopefully productive dialog. Secondly, I think Sparks unduly saddled Carrion with a primary claim he didn't actually make. I felt the crux of Carrion's initial post, and his claim, was that he would connect a career intelligence officer specifically trained in deception operations to FBI investigation of UFOs - and he did. Sparks suggested Carrion stated he would prove UFO events in 1947 were intel deceptions, which he didn't actually claim. Carrion stated he proposed that was the case, but he did not actually assert he was providing definitive proof on any UFO events, as I interpret Sparks and many others repeatedly suggested. Perhaps most importantly, Carrion's primary point, the deception planner-UFO connection, mattered to me, I found it interesting, and the potential significance is well understood by those who have read and absorbed his work to date. We may now proceed in sorting out the details, and Sparks or any number of interested parties may well have relevant and useful contributions to make, but I urge we not miss a point on which many of us agree and feel is important, please: Further research is justified. While Carrion keeps 1946-47 in his sights, Robert Sheaffer chose in his recent post to critically explore a much wider sample of alleged Mirage Men activities and those who research them. He cited various circumstances and opted to close the piece by sharing an opinion, certainly a reasonable choice of formats. "In my view," Sheaffer concluded, "those hunting for Mirage Men supposedly promoting the Flying Saucer phenomenon are themselves chasing a mirage." Like James and his analysis of the circumstances, Robert is entitled to his, but I'll have to disagree with Robert on this occasion. I'd like to share just a couple of the reasons I'm willing to entertain the possibility the Human Deception Hypothesis applies to select cases. 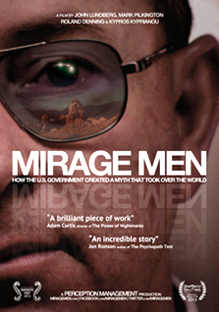 Many of you know the gist of the Richard Doty story, and his activities surrounding Paul Bennewitz, William Moore and Linda Moulton Howe as explored in Mirage Men, a book and resulting documentary by Mark Pilkington and company. I'd like to direct our attention to the part of the saga in which Doty, a Special Agent of the USAF Office of Special Investigations, willfully distributed info via bogus documents during the 1980's. The docs were about alleged extraterrestrials and apparently intended to be interpreted as classified. Doty maintains he was acting in an official capacity, a claim which is debated to some extent, and the Air Force isn't saying one way or the other. Hold that thought a minute while we consider the Simone Mendez case. Her story is addressed in George P. Hansen's The Trickster and the Paranormal and my recent book, The Greys Have Been Framed, among other media. Mendez was a 21-year-old airman at Nellis AFB in 1981 when a coworker approached her with a copy of a supposedly classified doc containing big news about UFOs and assumed extraterrestrials. There are several interesting twists and turns to the case, but, to the chase, Mendez ended up grilled by OSI, interrogated by the FBI, and her life was forever changed by the time she was cleared of potentially serious charges over an almost certainly bogus doc she was handed by someone else. What I'm presenting for consideration is the circumstances under which the Air Force fails to release information on so much as an inquiry into the actions of Doty, who admittedly and repeatedly shared forged docs, while, during the same era, Mendez was subjected to an emotionally grueling months-long investigation. She didn't have anything to do with making the single doc in question, and the Air Force later released files verifying at least some aspects of her ordeal. Meanwhile, Doty, who we continue to know so little about his official orders, was featured in a documentary in which he openly laughed about the multiple forgeries and his participation in deception. Perhaps solid conclusions are not fully available, but I assert further research is justified into the circumstances behind the double standard, as well as the objectives of such possible operations. I understand the burden of proof is on the claimant, but what I am proposing is not a conclusion, but a willingness to seek one which can actually be demonstrated. In his report, Stealth, Countermeasures, and ELINT, 1960-1975, CIA man Gene Poteat explained his experience with Project Palladium. The operation involved projecting false paints, sometimes termed "ghost aircraft," upon screens of unsuspecting radar operators. The bogus craft could be made to appear, at least on radar, to be any size desired, traveling on any flight path at any speed and altitude. Poteat wrote how missions were conducted by crews consisting of a CIA team, an NSA team, and a military support team. In at least some instances, "balloon-borne metalized spheres" were released in coordination with the false paints, thoroughly confusing enemy pilots. We might want to keep such circumstances in mind when we read and hear about radar-supported UFO cases, particularly those involving seemingly incredible flight maneuvers. We might also want to keep them in mind before relieving Uncle Sam of any responsibility in trolling the UFO community. At the least, it seems reasonable to consider such projects in the context of human deception and UFOs. We could go on, but let's get back to Carrion's work. Interesting as they may be, nothing about the two examples offered above necessarily have anything to do with what James Carrion researches. I fully concede that to be the case. I offer them solely as instances of why I feel research is justified into the likelihood the UFO topic has been exploited by intelligence agencies. However, what happened somewhere else, during a different era, or [insert your personal story or favorite UFO case here] have nothing to do with research of other specific events. What happened to somebody in Phoenix in the 1990's or John Keel in Point Pleasant in the 1960's doesn't necessarily have anything at all to do with Roswell. The arguments that all UFOs can't be deceptions are common, although the premise has nothing whatsoever to do with studying any given specific circumstance or limited chain of events, such as took place in 1946-47. It is simply not a reasonable response to the issue. The fact some apples are red doesn't mean there are no green or yellow ones. There are many different explanations for the many different UFO cases, whatever those explanations may prove to be. I say let's explore them. Maybe they can't all be deceptions, but I'd still like to know which ones can. Speaking of examples that justify research into deception planners/Mirage Men, here's one more. After World War II there was a classified weapons research and development project. It was discontinued, but was misrepresented to be ongoing and consisting of an airborne weapon more powerful than the atomic bomb. It wasn't, and in at least one instance, a newspaper carried the disinfo story right on the same page as an article about the Kenneth Arnold sighting. A hat tip goes to James Carrion for that one. Those of us who have read Anachronism know all about it - and there's more. You really should read it if you're interested or want to intelligently question James Carrion's findings. I look forward to ongoing work from Carrion and like-minded researchers, and I hope others such as Sparks and Sheaffer will continue to inquire further. I advocate a willingness to reasonably consider what's presented, and a willingness to follow it through to completion, wherever it may lead.